My kids are really looking forward to Halloween this year. We are the "mean" parents who don't do the whole trick or treating thing. That's not to say that we frown on costumes and fun, because we don't. We just limit what the kids do to events like fall festivals and such. We do not hit the neighborhood and start ringing doorbells. The kids hated this at first, but it actually works into a pretty good deal for them. 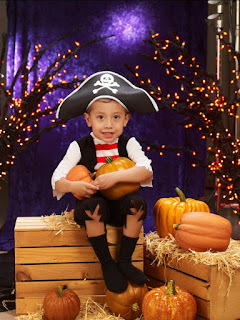 We attend fall festivals that are generally not held on Halloween, so they get to have fun multiple times. What's fun about not trick or treating? Our Halloween night is the ultimate in family time. The four of either cook dinner together or splurge on pizza or other food, since we don't eat out much. Then we curl up on the couch for movies, usually scary ones. I buy Halloween candy and make special Halloween treats, so the kids are not missing out on anything. It is a night we all look forward to all year long. A great place to stock up on all your Halloween needs is HEB. They have everything you need for a fantastic Halloween celebration at great prices. Be sure to check out their great Halloween recipes; I am so going to make the Pumpkin German Chocolate Harvest cake! Yummy! You truly can get "More Halloween for Less Green" at HEB! My friends at HEB are going to give one of my lucky readers a $20 gift card! Simply click over to HEB's awesome selection of costumes, then come back and leave me a comment about your favorite one. This is mandatory for entry. Check out all HEB's spooky Halloween recipes and leave me a comment on one you'd like to try. Leave me a comment telling me your favorite scary movie. Be sure I have a way to contact you if you win! Leave separate comments for each bonus entry. Contest is open to residents of the US only. Deadline to enter in 11:59pm CST on Sunday, 10/25/09. Winner will be announced and contacted on Monday 10/26/09. I Like the good witches costumes..see my blog post about my witches hat. its orange and black but nice.. I can't wait for HON movie.. I choose three different recipes to try.. I like the Star Wars costume. I want to try the Orange Chocolate Creepy Crawler Cake. My favorite scary movie is Final Destination. I like the Sugar Plum Fairy costume! The recipe for the Light Pumpkin Pancakes looks great! My favorite scary movie is Charade with Audrey Hepburn. Think I'm going to go with Spiderman. Think I'll bake Witch Finger Cookies, that way I can chew nails other than my own. To show my age, it used to be Creature from the Black Lagoon, used to scare me to death, till I saw Alfred Hitchcock's "Psycho"
I'd like to try the Pumpkin German Chocolate Harvest Cake. Scary movies are generally too scary, but I like Dracula movies. The witch fingers are neat!! Thanks for the chance. I like the cheerleader costume. I love HEB! The Sugar Plum Fairy is cute! I'd like to try the Pumpkin German Chocolate Harvest cake! The pirate is my favorite costume. Thanks! I would like to give the Light Pumpkin Pancakes a try. They sound like a delicious seasonal breakfast treat. Thanks! I don't watch scary movies, but I have seen Psycho, so that's my scary movie pick. Thanks! I like the Star Wars costumes! My favorite scary movie is Rosemary's Baby. It nearly scared me to death! I like the sugar plum fairy costume! So cute! I like the Scream series in movies... not a big fan of "really" scary movies! I am a big CHICKEN! I'd like to try the Light Pumpkin Pancakes. MMM sounds delightful. I just started following... Just found you! Love it! I like the Sugar Plum Fairy costume. I'd like to try the Creepy Crawling Spiders recipe. Nightmare on Elm St. is pretty scary. My favorite is the Snow White custom. They kids loved My Little vampire! I love to try the Halloween Sugar Cookie Recipe! The Sugar Plum Fairy costume looks very nice! The Witch Finger Cookies recipe looks very tasty! My favorite scary movie is Silence of the Lambs.